December is a time of the year when many people in the United States get into holiday festive mode. Christmas decorations go up everywhere, both outside, on the buildings and streets and inside the buildings. Towns and cities are lit up with beautiful lights at night as most homes adorn Christmas lights and many trees on streets are wrapped in lights. When my brother and I were little, we would make guesses which homes were Jewish because the ones that didn’t have lights like my own home were likely Jewish. Hannukkah, a Jewish holiday that lasts eight days, occurs in December or sometimes in November depending on the Jewish calendar. As days got closer to Christmas, I asked the Cameroonians in Bamenda, “Where are the Christmas decorations? I don’t see too many.” They told me that there would be more as days approached closer to Christmas. Even when Christmas Day arrived, I still noticed that there weren’t too many decorations. The only places that really had decorations were at roundabouts, which had mostly lights. Even when I was in Yaounde for a week, a couple weeks before Christmas, I saw that there were still not too many decorations. I saw lights only on one street in a very posh neighborhood. I have not seen one home with Christmas decorations on the outside of a house or apartment. One should keep in mind that only about 30% of Cameroonians are Christians. However, the majority of the population in the Northwest region is Christian and even the animist which compromises 50% of the Cameroonians still celebrate Christmas. Even though I am Jewish and traditionally do not celebrate Christmas, I still celebrated Christmas in Cameroon on Christmas Day. 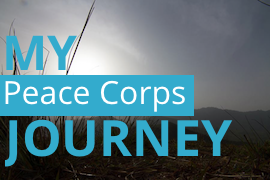 One of my responsibility as a Peace Corps Volunteer is to integrate myself into the Cameroonian community and culture so that I can perform my job well and learn about the culture. Participating in cultural events whether it’s religious or not, is a great opportunity to help me gain a greater understanding of how humans in their homeland interact with the society. I received two invitations to spend the Christmas day with their families. One was from my work supervisor, Samuel, and the other was from Hilda. Samuel’s home which was very modest for Christmas. I first went to my work supervisor’s home where I had the opportunity to meet his family for the first time including all five of his children. One of the first things I noticed when I entered his home is that there were no Christmas decorations. I commented to Samuel about what I noticed. He said, “We’re very modest. It’s better for me to save money for more important things such as education for my children.” I was really delighted to hear that he set good priorities and hold such a high value in education. Samuel and I spent some time talking about various cultural differences between the Americans and Cameroonians. His family also offered food which included rice and chicken. Then I went to Hilda’s home where her home had a Christmas tree. Because evergreen trees do not exist in Cameroon, her tree was made of plastic. Just like any Christmas trees we see in the United States, it had ornaments and lights. 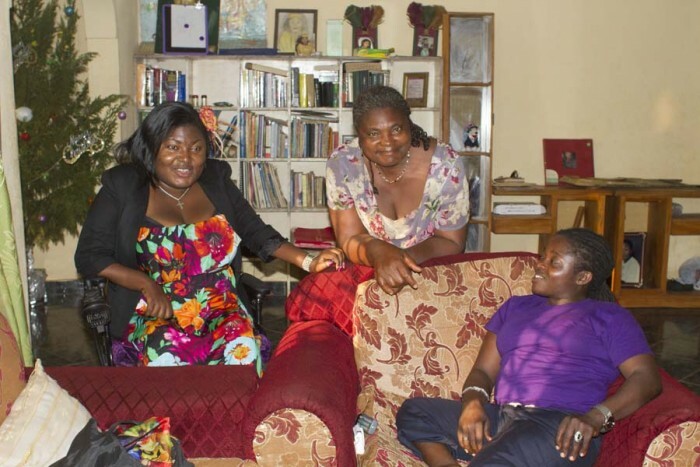 I met many of Hilda’s family members who live with her. 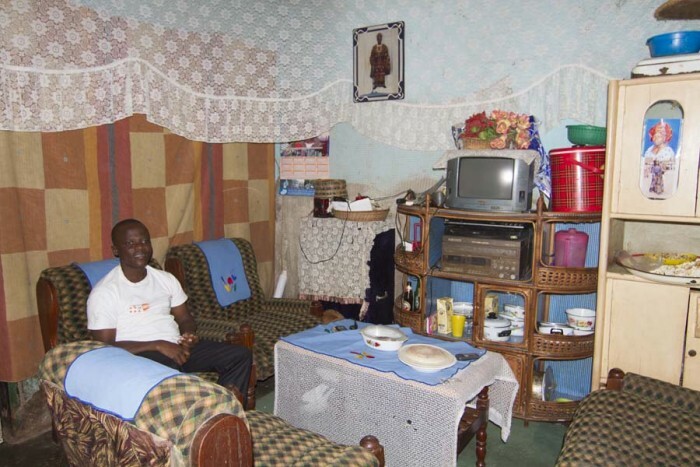 In Cameroon, it’s not uncommon for brothers and sisters and their families to live together in one home. 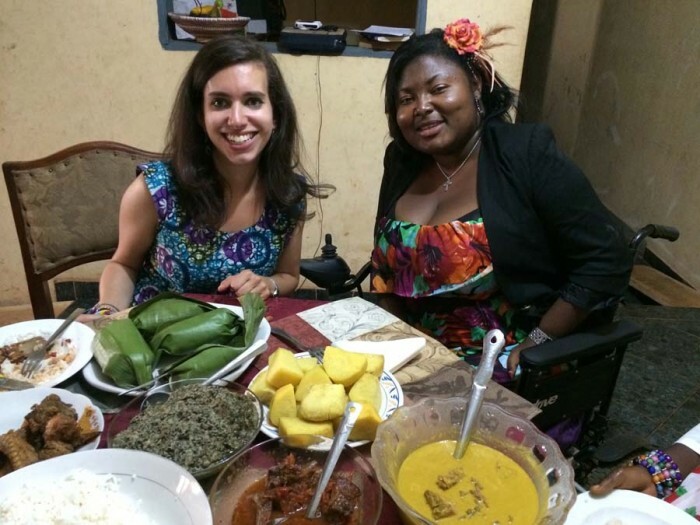 Her table filled with a wide variety of traditional Cameroonian food which included yams, rice, beef, chicken, and couscous. 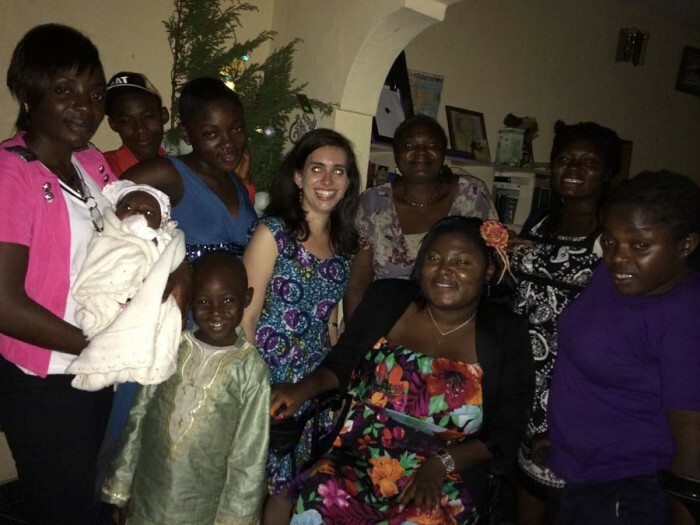 We spent some time talking and like at Samuel’s home, we discussed cultural differences. 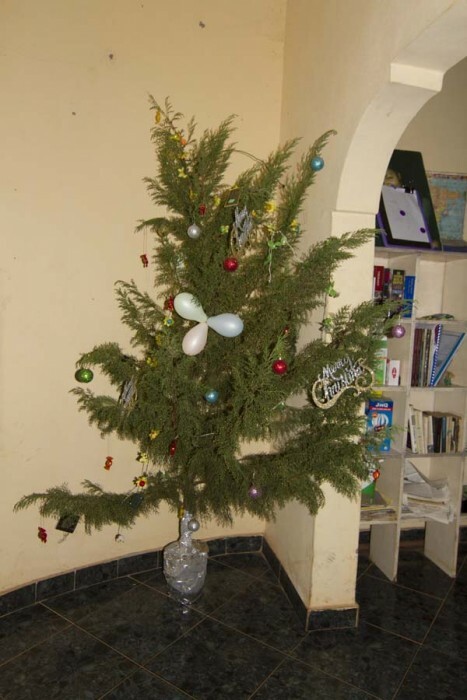 So, while Cameroon may lack in Christmas decorations which is not a bad thing at all as they are saving their money for far more important needs, they still share many similarities with the Americans when it comes to celebrating Christmas. Some families have Christmas trees. Many families enjoy a big feast with friends and relatives. Children are off from school and receive presents. Some go to church too. On top of all, during the last few days prior to Christmas, being at the shopping areas in Cameroon is just as bad as it is in the United States. Both places have too much traffic and people.